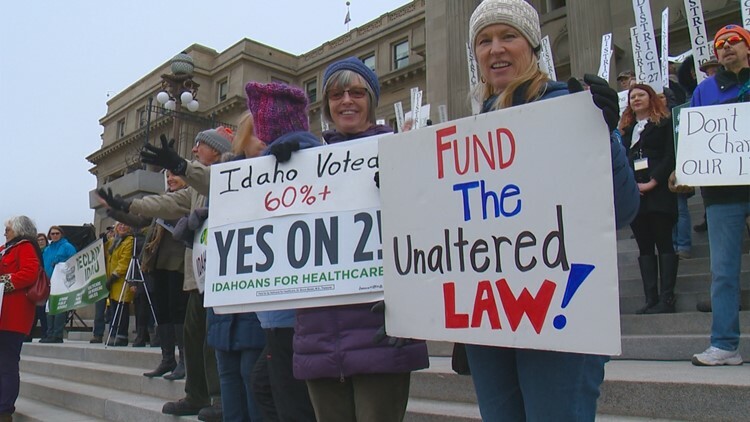 Hundreds rallied at the Idaho Statehouse Monday to urge lawmakers to implement Medicaid expansion without any restrictions. Medicaid expansion in Idaho will be tracked as a stand-alone item so that lawmakers can see how much it's costing and where the money is going. BOISE, Idaho — Medicaid expansion in Idaho will be tracked as a stand-alone item so that lawmakers can see how much it's costing and where the money is going. Medicaid Division Administrator Matt Wimmer also told lawmakers on the Joint Finance-Appropriations Committee on Monday that there will be decreases in the cost of some other state programs with the expansion. Voters authorized Medicaid expansion with an initiative in November that passed with 61 percent approval after years of inaction by the Idaho Legislature. The expansion will provide access to preventative health care services for about 91,000 low-income Idaho residents, according to a risk management company hired by the state. The federal government would cover 90 percent of the estimated $400 million cost of Medicaid expansion, and Idaho lawmakers have to figure out how to pay the state's share.